With this award we hope to not only honor Rosalind Franklin’s legacy, but honor those women who have also shown exemplary leadership and led the way through previously uncharted territory. Note: Awardees are expected to commit to being present to receive the award and to give short remarks at a plenary session when they accept the award in person at the 2019 BIO World Congress, July 8-11, 2019 in Des Moines, Iowa. Nominees should be visionaries, exhibit leadership qualities, and have pioneered efforts in industrial biotechnology and agriculture and related fields and applicants should demonstrate significant innovative contributions in a field integral to the advancement of a biobased economy. Women in both business and academia are eligible to receive this award. Disciplines that may be considered include business, biological engineering, bioinformatics, biochemistry, enzyme development, biobased products, economics and education. Nomination forms should highlight contributions to the important goal of using industrial biotechnology and agriculture innovation to develop sustainable bio-based value-chains. Nominations will be accepted until April 9, 2019 at midnight EST. A selection committee will review the nominations and announce the award recipient in April. 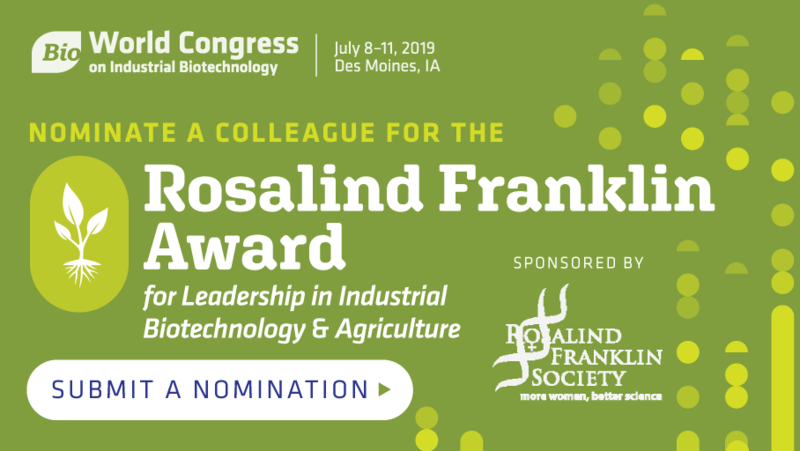 Recipient will be presented with the award during a plenary session at the 2019 BIO World Congress in Des Moines this July.